The second part of our 4-phase approach to air compression systems is air compression system design and air compressor system fabrication. If you know what you want out of your air compressor system, but aren’t quite sure how to get there, our system design and fabrication service is probably for you. What Is the Purpose of Our System Design and Fabrication Service? After our system analysis, you will know what you need to do to optimize your air compressor system. But how do you do it? That’s where our system design and fabrication service comes in. Its purpose is to come up with the right design and subsequently fabricate a system solution that will resolve any problems uncovered in the system analysis and allow you to best utilize your air compressor system based on the goals and requirements identified during the system analysis process. How Does the System Design and Fabrication Service Help Businesses? The system design and fabrication service helps businesses by providing them with an efficient system design and helping implement it. Most companies that need air compressor systems have expertise in areas other than compressed air and compressed air system design. You may not have the time or the experience to optimize your air compressor installation. We can provide the design and fabricate the system with a turnkey approach that fits your budget. What Are the Benefits of Our System Design and Fabrication Service? 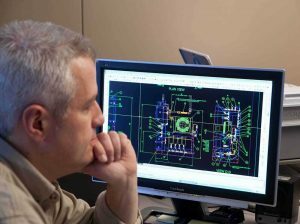 We are able to provide you with a wide range of system design and fabrication services, including reviewing dimensional and orientation limits, budget analysis, system layout, electrical and flow schematics, and turnkey system fabrication of air and gas distribution systems, structural assemblies and more. The end result is that you benefit from our expertise in creating the ideal air compressor system design for your facility and your specific business. The system design and fabrication service is the natural follow-up to Phase 1: System Analysis. It allows you to fully benefit from the goals and solutions identified during this analysis, as well as setting you up to implement subsequent phases, such as implementation and maintenance. Why Choose The Titus Company for System Design and Fabrication Service? At The Titus Company, we have designed and fabricated air compressor systems for hundreds of businesses successfully. We know exactly what the capabilities of our air compressors and related equipment are, and we know how they will fit into your business. We have a collection of trained air compressor technicians with a level of knowledge and experience you are not likely to find anywhere else. When it comes to developing an overall compressed air solution, you could not be in better hands. If you are not getting the most out of your air compressor equipment, experience the advantages of The Titus Company’s air compressor system services for yourself. Contact us today to learn more or to schedule service.